These Pets Are A Real Trip! In true Littlest Pet Shop fashion I can always count on my daughter to get all her Pet Shop pets out and lined up to watch the newest adventures of Blythe Baxter and her animals. Blythe Baxter has two amazing gifts – she can talk to animals and can create amazing fashion! Together with her pet friends- Zoe the spaniel, Pepper the skunk, Sunil the mongoose, Russell the hedgehog, Penny the panda, Vinnie the gecko and Minka the monkey, Blythe is determined to make her dream of a career in fashion come true. On DVD September 23, 2014! 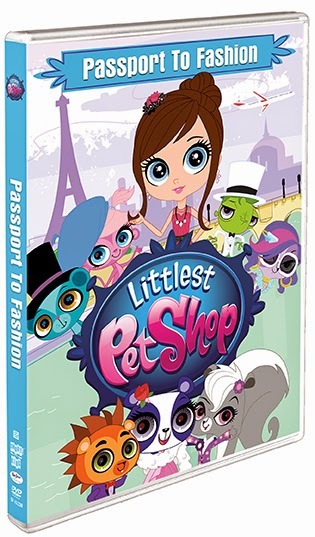 Join Blythe and her animal friends as they visit exotic cities such as Paris, Rio and Shanghai and learn that true friends will support you no matter what!